As many of you know I am a fan of alternative desktops. My favorite being E16. The only downfall of E16 is that the epplets, tiny applications that monitor, launch applications, and other important duties, can be a real hassle to install (and often too small to read). And other minimal desktops have nothing to offer. That is where applications like Gkrellm comes in. 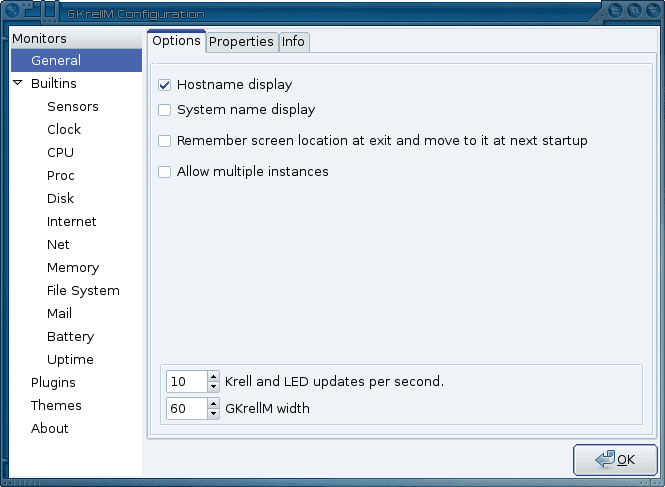 Gkrellm is a small stack of system monitors that is configurable and themeable. Using this application can solve a lot of your problems when using a lightweight desktop. Installing Gkrellm is simple. You can either do a search in your Add/Remove Software utility, do a search for "gkrellm", select the correct results, and apply the changes. From the command line you can run a command like sudo apt-get install gkrellm or yum install gkrellm. To start Gkrellm you can issue the command gkrellm to start up the monitoring system. Speaking of configuring, there are two ways to configure Gkrellm. You can right-click the window to open up a menu that offers the Configuration entry. Or you can click F1 when your mouse is in the Gkrellm window. The configuration is very simple and straight-forward. From here you can configure which monitors to include, the theme to use, general options (which apply to the Gkrelm window itself), and any plugins you might have installed. Who wants to have a monitoring window on their desktop that doesn't match their desktop theme? And for that Gkrellm has a number of built-in themes. Click on the Theme entry from the configuration options and scroll through the various themes. You can also install themes. Find some themes from such a site as Freshmeat and untar the files in ~/.gkrellm/themes/. Restart Gkrellm and the themes will appear in the Themes section of the configuration window. Gkrellm allows me to use my favorite Linux desktop and not miss out on simple necessities such as time, system stats, etc. If you're looking for an easy to use system monitor, Gkrellm is what you need. Useless trivia – I actually discovered this utility a couple of months ago when I performed a search for “Dell” in Synaptic Package Manager. Someone made a gkrellm plugin for monitoring hardware on Dell laptops (didn’t seem to work on my particular model however). While I really like what this utility is capable of, I really wish the look and feel were a bit more customizable. Excellent!! Now THIS is what I love about Ghacks! New stuff, great articles. Thanks for this one. You said you’re a fan of different desktops, which is your favorite? Off topic: I downloaded Ubuntu 8.10 and dropped it to a CD since it said I could boot and play with it without doing anything else. But when I tried to boot it, I got an error that seemed to reference my SCSI card or drives. Seems that the default build of Ubuntu may not have the drivers to support SCSI. Alexander Dombroff: My favorite desktop, and it has been so for years, is Enlightenment. Now I am a purist and prefer E16 over E17. But E17 will appeal to a lot of people. Jojo: What is your system setup? Jojo: Of the three drives you have in the machine, is one a primary drive? If so try this: Unplug two of the three, install on that one drive, and after the install is complete plug the other two drives in. When you plug the other drives in Linux will recognize the drives. If you want to format them after the fact, you can do that. Hey Jack a completly different topic. What do jou think about Avira AntiVir Rescue System? @Jack – Thanks but I have 5 physical drives, not 3. One of the SCSI drives is my primary drive. Unplugging drives would also require me to make BIOS changes, which I don’t want to do at this stage. And I don’t really want to install Ubuntu. I just wanted to run it off the CD. I guess this is one of those examples that helps keep Linux at the low market share it enjoys. I’ve never had a problem with any Windows version recognizing my SCSI drives. gkrellmd service runs in the background and use a lot of performance. i found the process while coping a 2GB file from my external hd to a internal, gkrellmd used about 10% CPU, even i doenst started gkrell! !